Let's start with the markup then. We'll take advantage of definition lists, which I feel is a perfect match for FAQ content. Pretty clean, but there is one bad mark on our semantics rating: the extra div in the answer element. This is not entirely necessary, but it helps the smoothness of the animation we intend to do with jQuery. Long story short, if you use a function like .slideToggle, your animation will be much smoother if that element does not use any padding. We achieve the padding we need through this extra div. More info on this here. Then we write the actual code. Few things of interest here. Because we are floating the answer tab, we'll clear the float on the definition lists themselves to make sure spacing between them works out. We are also using CSS image replacement on the .answer-tab anchor links, for the most efficiency possible (image only needs to load once). Answers visible, styling still makes sense. 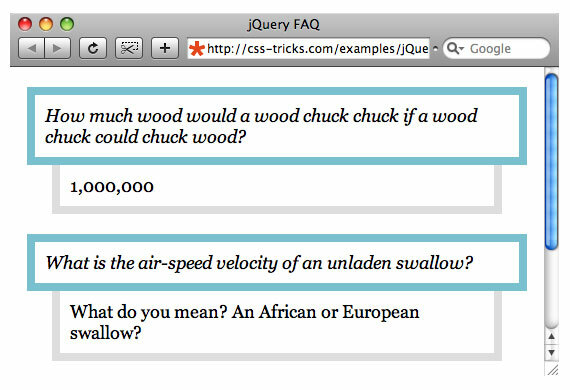 You’ve got to be kiddin’ me – I was writing an exact same article (“Fancyfying a FAQ page with jQuery). Well, guess you beat me to it. Anyway, your article was better anyways, really like this implementation. Keep up the good work Chris! Aw. Sorry man, but you should publish it anyway for sure. There is always room for more tutorials and teaching on the web. Want to know something really freaky? Check out my Twitter status a couple of hours before you placed your article online. From Monty Python , lol ! Love your approach with this tutorial. You have a well defined process that I would love to achieve. I tend to start coding an idea and end up running in circles till I get it right. Uhm.. first answer is wrong. True answer is ‘A wood chuch would chuck as much wood as a woodchuck could chuck if a woodchuck could chuck wood BUT a woodchuck cannot chuck wood for a woodchuck is a gopher. Excellent post! I was about to create something similar for a client using jQuery. I believe you just saved me several hours; will use your example as a starting point. Thanks, you rock! I’m a subscriber to your feed here and I currently view my feeds in an external application (I haven’t found a fast enough Firefox add-on) and I had to come here and comment to at least show my appreciation for the time that you put into writing and sharing content such as this. Your Dynamic FAQ Page is awesome. I’ve already begun to customize it and the possibilities and potential uses for it are many. Thanks a lot. Keep the good stuff coming. Good idea, I added it to the live example. Just need a cursor: pointer; on the .answer-tab in the CSS. I saw this earlier and didn’t say anything… but it leads me on to an interesting request about css caching. If we make changes how would you as a front-end developer with little knowledge about headers/caching/php make it so that your latest CSS is pulled for the user. Loads of people make the mistake of using the same file name and the styling looking horrific because of this over sight… so it would be interesting to hear/see your thoughts on it! Then, if I roll out a change, I alter the v parameter to 1.1 or 2.0. This will force a new download in just about every browser and proxy cache I’ve ever tested. Thanks! I may just have to incorporate it somewhere! Excellent post – especially as it uses progressive enhancement; although, with CSS disabled, the answers are all visible, until you click on ‘Answer’. I know it would only take a line of code, but in user experience terms, it would be advantageous for the cursor to change to the hand, especially for when you want the answer to hide. Very nice but takes up a lot of real estate for three questions. Would be nice if an accordian feature was added so that you could separate questions by subject heading. Instead of hiding it with CSS via display: none;, you could kick if off the page with some huge negative top and left positioning and position: absolute;. I think that’s generally the technique used there. Then just remove that CSS with the JS. I notice with your demo the answer block isn’t visible on screen before being hidden with the jquery but there is a brief pause before the “answer” tab is added. What can I say? My husband’s name, and I’m not kidding, is Chuck Wood. Oh, and nice tutorial! Thanks! This is very cool. I might incorporate this into a project of mine and change it up a little, i’ll let you know how it turns out if i decide to use it. 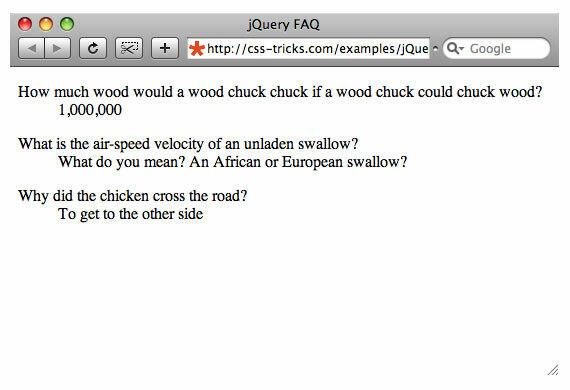 A wood chuck would chuck as much wood as a wood chuck could. This is nice, and pretty. But in terms of usability, the question itself should be click-able to reveal the answer. In terms of design (“de-sign”) the “answer” button is not necessary. The standard and expected behavior for FAQs is “user clicks question for which he/she wants the answer”, and this implementation breaks that expectation. Nice clean code. 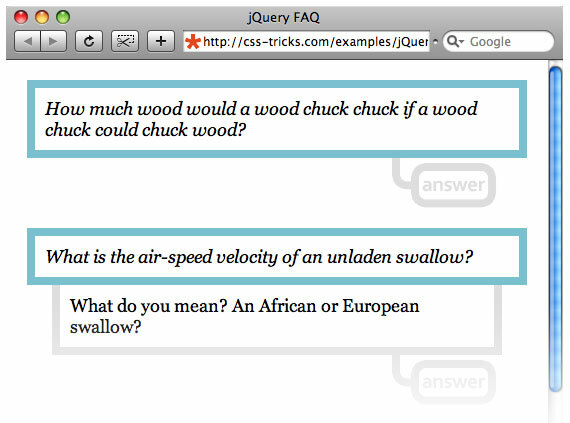 I did something like this a year or two ago, of course, I didn’t integrate jQuery. Nice sample. Nice tutorial for achieving the desired effect but I would never use this for an FAQ. Why hide the information when people are generally scanning an FAQ looking for information? I also think that making a button called “answer” may lead some users to believe they can click and answer questions themselves. Great article, Chris. I’m really beginning to understand JQuery, and it has given me ides for my own site. Thanks again. A great 2009 to you. Yeah really good tutorial. In case anyone else thinks they’re going mental or maybe it was just me; I originally tried to figure out the jQuery using the code example & it took me ages to figure out where the ‘answer-tab’ came from!? After downloading the demo I realised that this was part of the append with an anchor tag. My mind is at ease now :) Cheers Chris. No-one has mentioned it yet, but if you (someone) worries about the semantics of the extra div – couldn’t you add that with jQuery too? I do agree that adding the extra markup via jquery seams to me like a perfect solution. Hi Chris. A demo would be helpful. Thanks. Ahh, there it is Neal. I meant an on page demo. I tried doing the same using David Walsh’s Mootools accordian and Chris’ demo but the scripts were conflicting. I’ll try the same with yours. I really love the look of this, but I have a question. I’m quite a jQuery noob but I’m confused as to how the answer-tab class can possibly be clicked if it doesn’t exist in the markup and isn’t appended either. If I’ve totally misunderstood then I’d appreciate someone explaining what’s actually happening here! A wood chuck could chuck as much wood as he could if you gave him a chuck for every chuck he would. Oh and you should give MooTools, or even Prototype, a chance. I started up with Prototype and was hesitant to try MooTools, but am sure glad I did. It is very enjoyable. JQuery just gets a lot of hype because John Resig pushes the name while other are more laid back. Great tutorial! As I am new to jquery, I would like to learn how to do something similar to what Firefox does. http://www.mozilla.com/en-US/firefox/3.0.5/releasenotes/ While it’s not exactly a FAQ page, I think it would work for one. I tried this with my screen reader (Supernova/HAL 8.0) and it didn’t read out the answer. It read out the question fine and it read “answer” but I was not able to click on the actual answer “button” using the keyboard. So..in effect this is not accessible to blind users using screen readers or mobility impaired users who have to rely on keyboard access. THANK YOU, for pointing this out. Pretty sorry to screw something like that up in an article that is ABOUT accessibility. I believe I have fixed the problem. The problem was that that answer tabs themselves ARE anchor links, but did not contain an href attribute. So, they were unable to be “tabbed” to or other wise individually selected by the keyboard. I have fixed this, so tabbing to it and pressing return should activate the link and reveal the answer. I made one more change that will hopefully make things slightly better. I added title attribute to each link that should read out “Reveal Answer”, which should be a better explaining the behavior a bit. Same problem. The blind user will not know about the answer below. “Answer” as a name is perfectly clear (and you don’t need to add “Reveal”)……it’s just that user will not know that it is placed above the answer (and will expect it below the “answer” button) since that is the tabbing order. I made some layout changes and code placement changes that I’m hoping might solve this. Now the tab appears along the left and opens the drawer that contains the answer on the right. The answer is actually after the code for the “reveal” link, so I’m hoping that is more obvious. I tested this again with my screen reader (and Internet Explorer 6.0). The layout was seriously mixed up (with the “answer buttons” scattered around the page below). In theory though, your thinking should work and when disabling CSS it looks as though it should be perfect, with the answer appearing below. When disabling CSS….for some reason the screen reader mixes up the sentence and the “answer” link and does not read out the “answer” link. The screen reader reads out “Answer – Mixed Link” for the “Answer” link and usually when that happens the link itself does not work (not able to click on it). I have no idea why. It might be worth “moving” the link so that it appears in the next line when disabling CSS so that is not read out as one sentence? And also take a look at the layout in IE 6.0 :) I haven’t looked at this in IE 7.0. Firefox is ok but it doesn’t work with the screen reader (no worries, it never does). Web Accessibility can be a nightmare……!!! This works perfectly…both for screen readers and mobility impaired users. I think this is going to be subject of this weeks screencast.